Captura Continua: Will the Guptas determine the ANC succession race? Three weeks after the Guptas’ private email correspondence began cascading into the public domain, revealing the depth of the capture of the South African state, we are yet to see outrage and a fightback from the ANC. The party elected to govern by South African people, but now essentially cuckolded by the Guptas, has shown it is powerless against the family. The Guptas appear to be still pushing buttons behind the scenes and their main focus is to ensure that they stack the deck at the ANC’s 54th national conference, mostly to secure their new Number One. By RANJENI MUNUSAMY. Nkosazana Dlamini-Zuma has publicly accepted nomination for the position of ANC president, making her the first woman in the history of the 105-year-old organisation to contest the top leadership post. But far from this being a notable moment in history, it is the occasion for despair. Dlamini-Zuma has, without reservation, consented to becoming top of the ticket sponsored by the Gupta family. Up to this point, one could still give Dlamini-Zuma the benefit of the doubt that she was simply riding the ANC Women’s League (ANCWL) wave and would distinguish herself from the Gupta herd. But last week the ANC Youth League (ANCYL) announced its leadership slate, the first ANC structure to do so formally. “Comrade Nkosazana Dlamini-Zuma is the president of the ANC, comrade David Mabuza as the deputy president of the ANC, Comrade Ace Magashule as the secretary general of the ANC, Comrade Nathi Mthethwa as the national chair of the ANC, DSG for monitoring and evaluation Comrade Jessie Duarte, DSG for organising and campaigns Comrade Fikile Mbalula and the treasurer general Comrade Maite Nkoana-Mashabane,” ANCYL secretary general Njabulo Nzuza announced at a media briefing following their national executive committee meeting. The ANCWL’s endorsement of Dlamini-Zuma and declaration that it wanted more women in the top leadership of the party at least had the veneer of punting the gender ticket. There was no such effort by the ANCYL. Mbalula, a former ANCYL president, was nominated for a position that does not even exist constitutionally in the ANC. Besides, Mbalula is now 46 years old and can hardly qualify as a “youthful” candidate in the leadership race. The second youngest person on the ANCYL slate is Mthethwa, who at 50 years old is hardly a spring chicken himself. So what is the Youth League up to? And why is Dlamini-Zuma such a willing participant in this agenda? In January ANCYL president Collen Maine indicated that their choice of presidential candidate would send “shockwaves” throughout the ruling party. “These candidates who have been mentioned are part of the system. They have been part of the system we want to change. We need bold leadership. We need a second revolution that will cause ruptures in the economy,” Maine told Reuters back then. Either Maine overestimated the impact of their endorsement of Dlamini-Zuma or their hand was forced to change the “shockwave” candidate they had in mind. There was also talk a few months ago that the ANCYL slate would include Malusi Gigaba, now the finance minister, and Mbalula, for top posts. Clearly that did not materialise. The #GuptaLeaks exposed that Maine was being scripted by the family’s PR firm Bell Pottinger to further their manufactured white monopoly capital narrative. So what else are Maine and his organisation doing on behalf of the Guptas? Since the release of their emails, there have been no public moves by the Guptas. They have gone to ground and not responded publicly to any of the revelations against them. Clearly the family does not believe their ecosystem has been significantly disturbed by the revelations or the reaction to them. While Gigaba and his public enterprises counterpart Lynne Brown are floundering to keep their heads above water, the people who should be most affected by the leak of the tranche of emails are manoeuvring from their place of seclusion. They are doing what they do best – arranging the political playing field to protect themselves and advance the interests of their business empire. There are two positions in the ANC leadership that the Guptas need in particular to keep their project on track: president and secretary general. The ANCYL slate stitches that up for them. President Jacob Zuma and his son Duduzane have been worthwhile investments for the family – both performing as lead marionettes in the Gupta extravaganza. But when Zuma ceases to be ANC president, his power diminishes and he would become a lame duck in the state. Duduzane will then be expendable – unless he is able to act as middleman to the successor as well. Enter Dlamini-Zuma, his stepmother and willing advocate of the “radical economic transformation” narrative that Duduzane and Bell Pottinger conjured up. There have been many moments in the chaos of this year when the former African Union Commission chairperson could have distanced herself from the chaos of the Zuma presidency. If hers was to be a clean, capture-free presidency, the most obvious move would have been to put fresh air between herself from Zuma’s disastrous midnight Cabinet reshuffle. After all, as a potential president, Dlamini-Zuma would inherit the consequences of that suicidal move – a downgraded and junked economy. Surely it would make sense to separate herself from that mess. It would also have been logical for Dlamini-Zuma to distance herself from the stench of the Gupta emails, especially considering they had nothing to do with her. The campaign of her main competitor, Cyril Ramaphosa, has been significantly strengthened by him speaking out against state capture and repeatedly calling for a judicial commission of inquiry into the mounting allegations. Ramaphosa’s campaign has morphed into an anti-corruption ticket basically by him stating the obvious: a full-scale, credible investigation is required. But Dlamini-Zuma is doing no such thing. She is not making any effort to separate herself from the capture contagion. Clearly it serves her agenda. The secretary general position is essential to control the functioning of the ANC. While the Guptas might not have captured Gwede Mantashe, his erraticism and volatility did not do much to protect the ANC from their influence. But the Guptas did have a handy insider in the office of the ANC secretary general in the form of Mantashe’s deputy, Jessie Duarte. She is entangled in their network and also exposed as talking to their script. The Guptas are now looking to seize control of the office of the secretary general entirely. Free State Premier Ace Magashule is the candidate who will deliver the ANC in its entirety to the family. Magashule has already been a handy asset for the Guptas, delivering massive provincial deals and feeding their media entities through the provincial coffers. His sons, Tshepiso and Thato, were exposed in the emails as having been ensnared in the Gupta network for some time. Magashule clearly has ambitions and a higher calling now. Opposition to his candidacy came from a surprise source in the past few days. Mbalula indulged in a spontaneous Twitter blast in which he recommended Gauteng Premier David Makhura for the position of secretary general. “Ace Magashule a definite no no no the man will finish what is remaining of our movement he will kill it inffect #Thinkingaloudbeyond,” Mbalula tweeted. This was followed by: “Ancyl let’s rally behind David Makhura as a replacement to Gweede Mantashe #ThinkingBeyondFactions”. Mbalula reaffirmed his sentiments to the Sunday Times, saying he had nothing against Magashule personally but believed the secretary general position was essential to the ANC’s survival. “The office of the SG comes with a lot of integrity. It must not take sides and annihilate people and run comrades to the ground,” said Mbalula. Clearly the police minister does not think too highly of the candidate nominated by the ANCYL. But Mbalula’s tweets do open the debate beyond the Gupta-endorsed slate and the faction rallying behind Ramaphosa. This weekend, Gauteng ANC chairperson Paul Mashatile threw his weight behind Ramaphosa, saying he could protect the country from all forms of capture. He told the ANC’s West Rand regional general council that the ANC did not need cowards who would put the country up for sale. He also dispelled the debate over a woman president, saying the ANC needed a capable leader of whichever gender. While Mashatile’s endorsement is indicative that Gauteng is likely to rally behind Ramaphosa, the province might be disorientated if there are more calls for Makhura to be deployed as a consensus candidate for secretary general. Gauteng is resolved that Mashatile should occupy one of the top six posts and has been negotiating with other provinces in this regard. But all the debates and negotiations around succession might come to nothing if the ANC remains powerless to the interference of the Guptas in its processes. The infusion of dirty money to influence the votes of branch delegates has been a successful lobbying tactic in the past and will no doubt be used again. The Guptas have sufficient resources to splurge on this project, particularly as they have a massive vested interest in the outcome of the leadership elections. 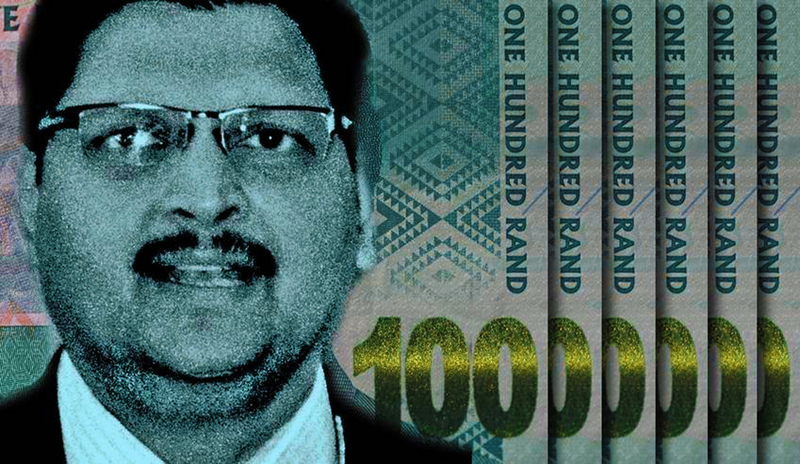 Buying off a president has turned out to be a boon for the Guptas. Even though the state capture edifice is cracking, the Guptas know that capturing the top leadership of the ANC in December will allow them to regain their foothold and have unrestricted access to the state machinery and resources.